I am still in search of how many tomatoes to plant each year. Let's start with usage. We make spagetti or sloppy joes at least once every week to ten days. We use about 6 bottles of ketchup a year. We like sun-dried tomatoes on pizza. Yes, if we could, we'd eat that every week. Fresh tomatoes, not so much. It's funny that because "I love a good mutton, lettuce and tomato sandwich where the mutton is nice and lean. . . " so assume 50 to 60 pints of tomato sauce, paste, or chutney. Also at least a gallon of dried tomatoes. Two gallons would be better. Now let's look at yield. According to literature found at the public library, about 25 pounds yields 6 quarts of sauce. Yield varies by variety of tomato, soil nutrients and weather or growing season. 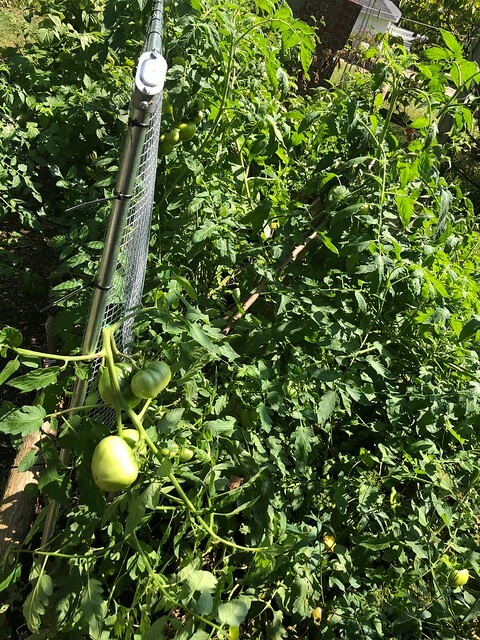 The first year I grew Blue Cherokees, I got two tomatoes per plant. Each weighed a half pound. Literature says I should get between 20 and 30 pounds per plant. Big disconnect! What gives? Let's start with growing season. This plagued me for a long time. No matter how early I started my seedlings, volunteers that started naturally outside always did better. I almost gave up. 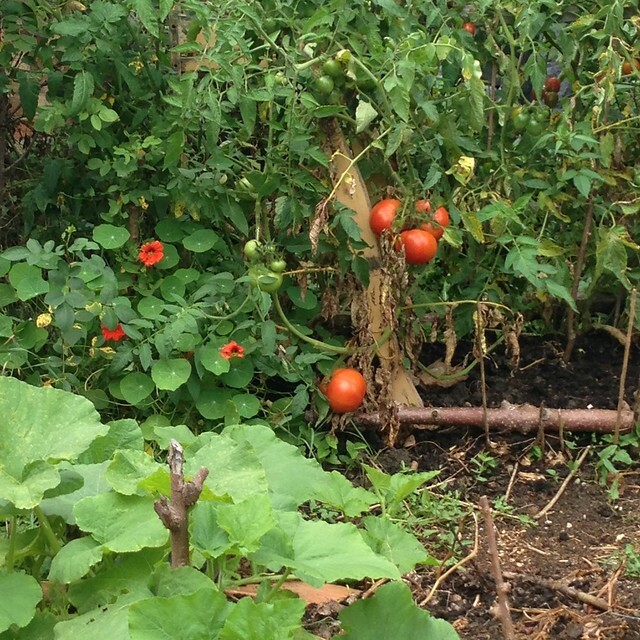 Our tomatoes routinely got ripe at the end of September or well into October. You could always tell the first frost date by when I shot these types of pictures. October 19th. Notice all those green tomatoes? Soil nutrients - our soil is horrible. Urban landscape, clay with loam, but no humous. 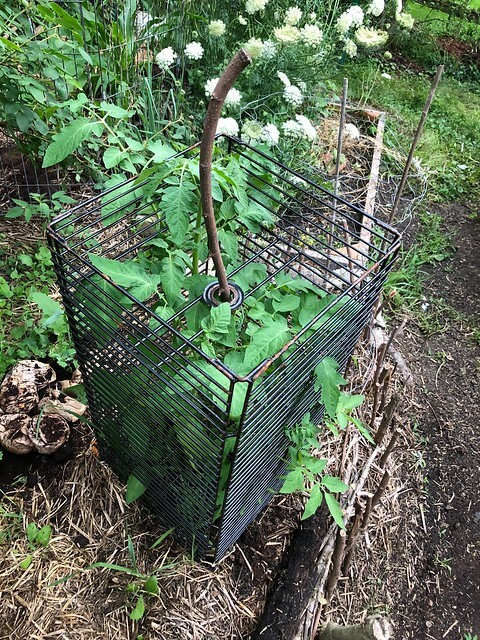 Nightshade grows well here so tomatoes should too. Heinz is based here so tomatoes should have no problem. Well, that's an ongoing issue. I've added sand, peat, and various amendments but after one season, they were gone and we'd start all over again. 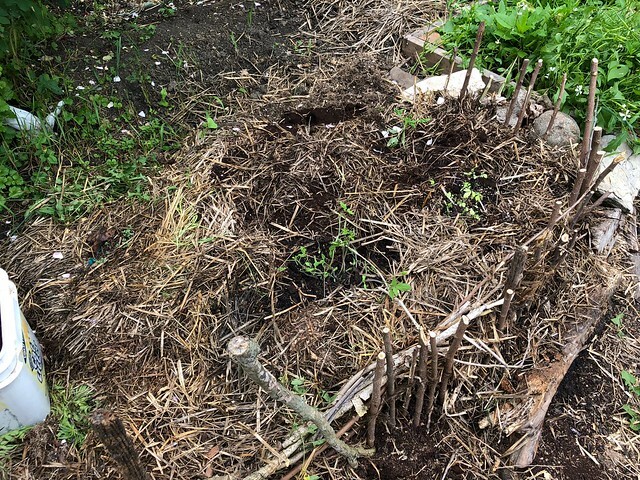 Then, I started composting and vermiculture. The vermiculture was like a secret ingredient that no one would share as part of the recipe. I noticed last year even the anaerobic worm poo made a big difference in my yield. 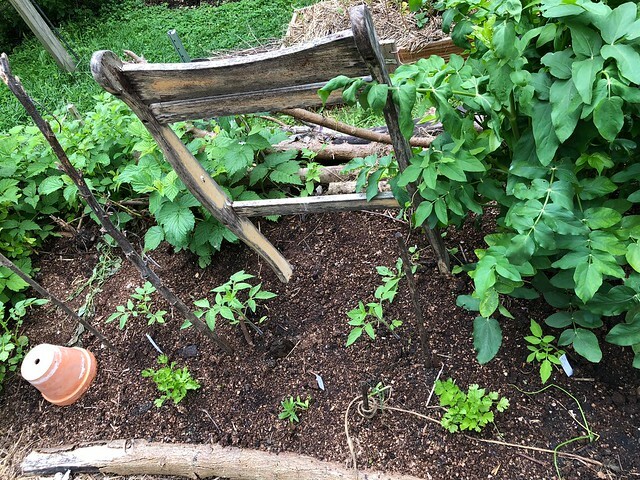 This year I added worm castings to the seed starter soil and rich compost to the bed. What a difference! If I'd have staked them properly and gotten rid of some of the leaves, they would be riper. However, I've already made spagetti sauce once, BLTs, and have 4 pounds of tomatoes in a one gallon freezer bag. I'd say that we are about two weeks in growth ahead of schedule. So how many plants did I put in? I had 4 - 5 of the grocery store unknown tomato which tastes like beefsteak and 3 to 4 blue Cherokees, see above. Some of them didn't survive transplant. Then the old seed experiment of black plum tomatoes went into straw. Interesting that. I got three different kinds of tomatoes from that experiment. 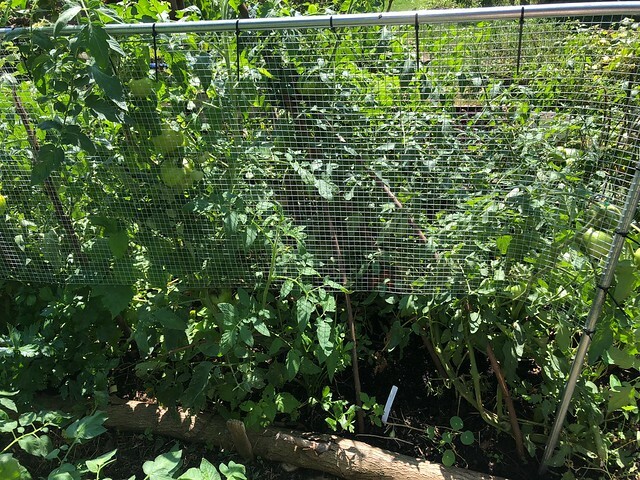 One is a blue cherokee, another is a large cherry tomato which grows like those vine-ripened six packs from the store. My label for it was stupice but the leaves are wrong for stupice. 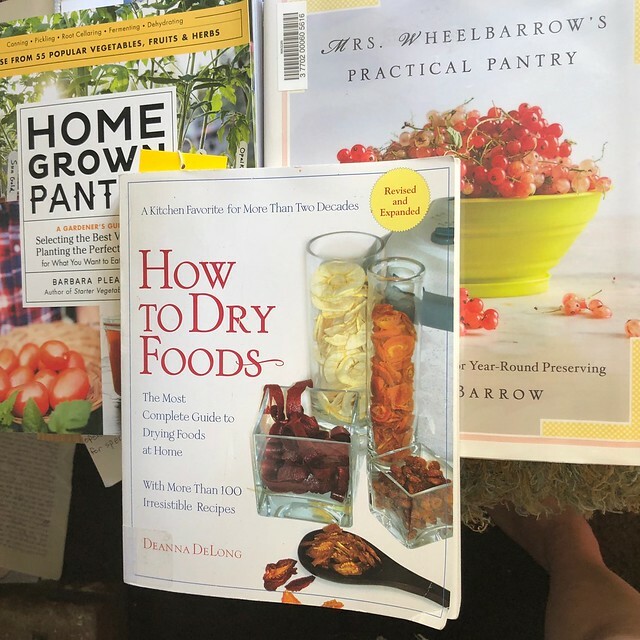 Going back to the literature, I should plant 6 juice/sauce varieties per adult in the house and 2 each for drying tomatoes like the black plum. Also 2 each of sandwich tomato varieties. So 18 juicies and 6 drying tomatoes in total. Volunteers, we did get a large cherry in the compost pile and a weird bunch in the front yard. I staked them. They tipped over and are sprawled all over. Not sure what they'll yield as they are in shade. And also in our path, getting stepped on. 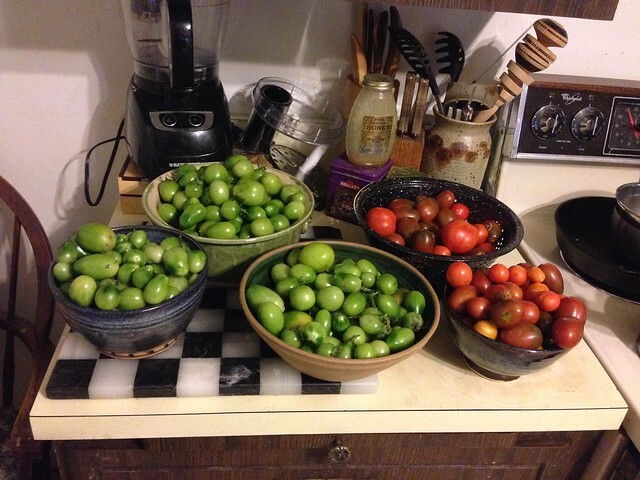 The year won't be over until you see me posting a giant bowl of green tomatoes. I'll have final weights at that time. Currently it's hitting 90° daily and there has been no rain.